[Hebrew] being imperfectly understood by many, by some, not at all; it has been necessary to translate our Prayers, in the Language of the Country wherein it hath pleased the divine Providence to appoint our Lot. In Europe, the Spanish and Portuguese Jews have a Translation in Spanish, which as they generally understand, may be sufficient, but that not being the Case in the British Dominions in America, has induced me to attempt a Translation in English. The first Jewish liturgical publication in America was Form of Prayer Performed at Jews Synagogue, New York, 1760; the second, Evening Service of Rosh-Hashanah and Kippur, New York 1761; ours, the third, Prayers for Sabbath, Rosh-Hashanah and Kippur, is the most distinguished for it is a far more substantial work than the earlier, and because it credits the translator, Isaac Pinto, a teacher of languages and merchant of New York. It is virtually certain that he was the translator of the preceding volumes as well. All appeared before the first prayer book with an English translation was published in London in 1770. The Library purchased its copy in 1947 for 250 dollars. Forty years later a copy brought over one hundred times that amount at a public auction in New York. 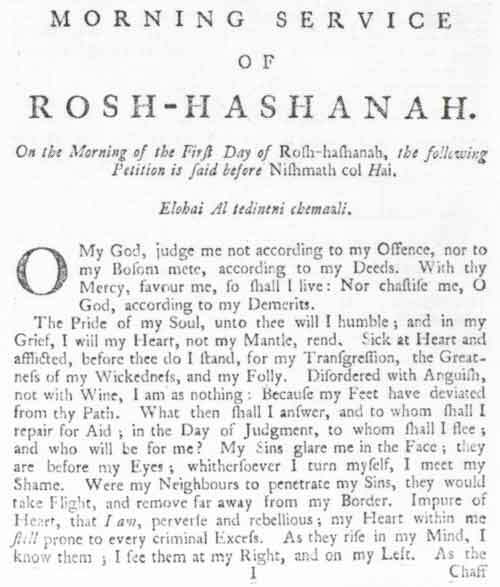 Prayers for Sabbath, Rosh-Hashanah and Kippur, translated by Isaac Pinto, New York, 5526 (1766). Rare Book and Special Collections Division. Not until 1770, four years later, was a prayer book with an English translation published in London, whose Jewish community was more than ten times the number of all American Jewry. Acculturation in the New World was swifter and more complete than in the Old. Mr. Pinto was truly a moral and social friend. His conversation was instructive, and his knowledge of mankind was general. Though of the Hebrew nation, his liberality was not circumscribed by the limits of that church. He was well versed in several of the foreign languages. He was a staunch friend at the liberty of his country. His intimates in his death have lost an instructive and entertaining companion; his relations, a firm friend; and the literary world, an historian and philosopher. This handbook is to be used by a member of a Hevra Kadisha (Holy Burial Society), which prepares the body of the deceased for burial. This manuscript manual written in Hebrew with an English translation contains both the pertinent instructions for the proper ritual preparation of the body and the prayers which accompany it. The scribe, Abraham de Jacob Israel Henriques Bernal, wrote it in Kingston, Jamaica, for D. K. Da Costa of that community, whose name appears on the cover. Bernal later served congregations in Philadelphia and Louisville, Kentucky. It is opened to the double title page, in Hebrew and English. Rabbi Hillel, Prayers said by the Spanish and Portuguese Jews during the Ceremony of Washing the Dead, translated into English by A. 1. H. Bernal (Scribe), Kingston, Jamaica, 5588 (1828). Hebraic Section. 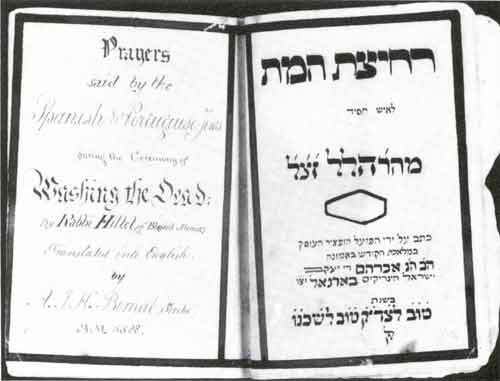 In 1828, acculturation had made such progress in the New World that Abraham Israel Henriques Bernal, a religious functionary, teacher and scribe, found it necessary to translate into English the Prayers said by the Spanish and Portuguese Jews during the Ceremony of Washing the Dead by Rabbi Hillel of Blessed Memory. A small delicately written manuscript in Hebrew and English, it contains not only the prayers to be recited by the Hevra Kadisha (Holy Burial Society) but also instructions for the ritual preparation of the body for burial. Membership in this society was traditionally reserved for learned, pious, and respected members of the community, so that if a translation of the instructions and the liturgy was needed, it speaks of the poor state of Jewish knowledge in the Americas. The manual was written in Kingston, Jamaica, for D. K. Da Costa, a member of its most distinguished family. “Abr. of I. H. Bernal” is found among the subscribers of that city for Isaac Leeser's Instruction in the Mosaic Religion published in 1830. Bernal later went to the United States and in 1847 was the Hebrew teacher of Congregation Mikveh Israel in Philadelphia, and three years later was employed as a religious functionary of the Louisville, Kentucky, congregation. 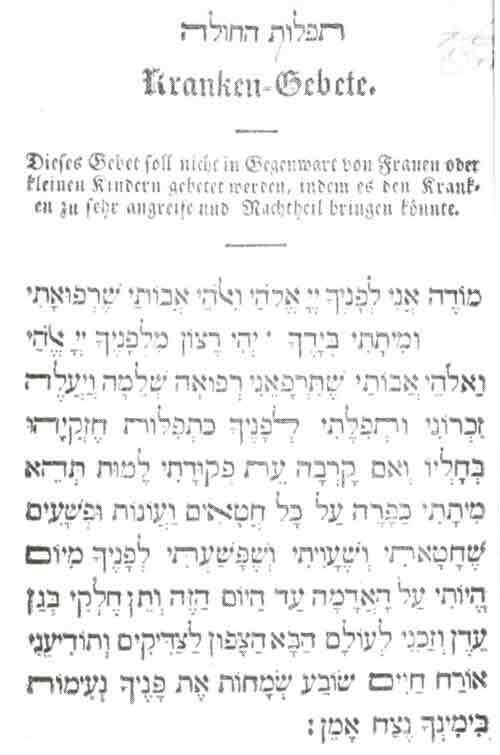 A collection of prayers to be said by those seeking healing was published in New York (in Hebrew wit instructions in German) by the Hevra Ahim Rahamim (Society of the Brothers of Mercy), organized in 1851. Open to a prayer asking God to “send full healing” or a place in paradise. The German instruction warns that this petition must not be said in the presence of women or small children for this could cause too great distress. T'filat ha-Holeh, Kranken Gebete (Prayers for the Sick), New York, 1854. Hebraic Section. 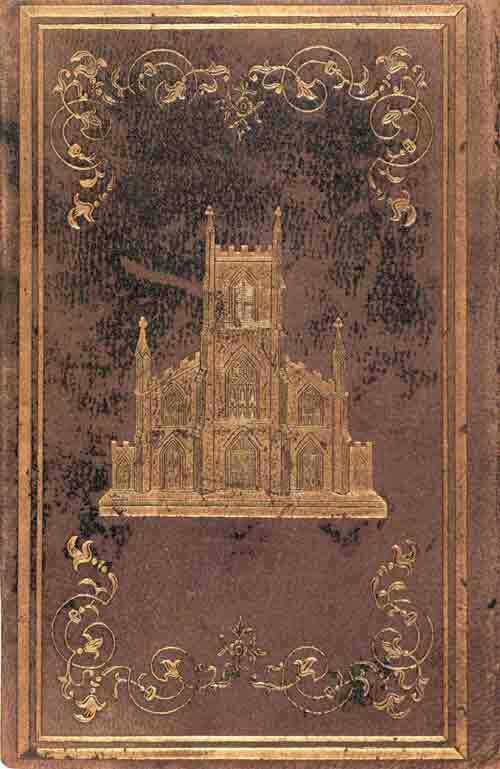 The prayer book prepared for and published by Temple Emanuel, New York, appropriately has the temple embossed in gold on its front cover. Seder T'fillah, The Order of Prayer for Divine Service, revised by Dr. L. Merzbacher, Rabbi of the Temple Emanuel, 1855; second edition, revised by Dr. S. Adler, New York, 1863. Hebraic Section. Three Reform prayer books appeared in the 1850s, each more radical than its predecessor. The first, Order of Prayer for Divine Service, Revised by Dr Leo Merzbacher (1810-1856), “Rabbi at the Temple Emanu-el'' of New York, was published in that city in 1855. Though prepared for one of the first and leading Reform congregations in America, it is an abridged form of the traditional prayer book, with Hebrew text and facing English translation, and it is paginated from right to left. The Kol Nidre prayer is omitted, but the five services for the Day of Atonement are retained, as is the prayer for restoration of the dead, “who revivest the dead ... and killest and restorest to life.“ Because it departed from tradition, it could not be used in traditional congregations; and because its revisions were slight it was not adopted by Reform congregations either, so very few copies, especially of volume 1, have survived. A pamphlet of prayers prepared by Rabbi David Einhorn for his Har Sinai Congregation, Baltimore. Unlike the prayer book which Merzbacher prepared for Temple Emanuel a year earlier, which is an abridgement and revision of the traditional Hebrew prayer book, the liturgy of Einhorn is a radical departure. Its language of worship is both German and Hebrew, and it is paginated from left to right. The complete text was published two years later in 1858, as Olat Tamid. 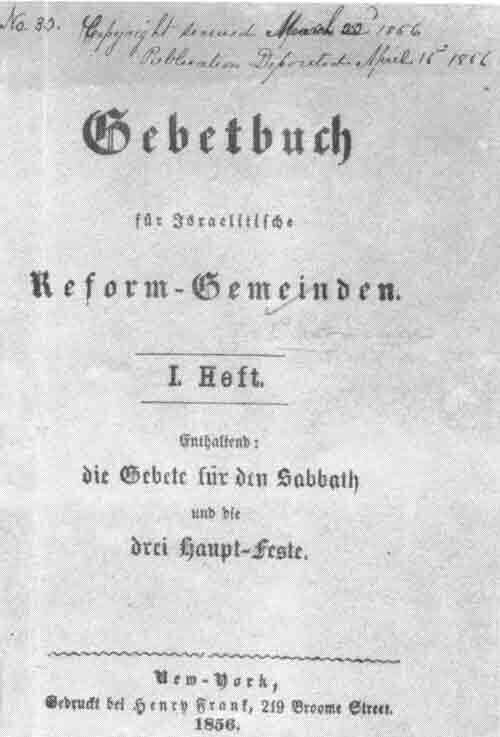 Gebetbuch fur Israelitische Reform Gemeinden, I. Heft, New York, 1856. Hebraic Section. In 1846, Isaac Mayer Wise began to plan a new prayer book which was to be a liturgy appropriate to the American scene, for as he explained in the Occident (vol. 5, p. 109) “the strength of Israel is divided, because the emigrant brings his own Minhag [liturgical rite] from his home.” He argued that “such a cause for dissension would be obviated by a Minhag America.” Ten years later, the projected prayer book was published in Cincinnati in two versions, the Hebrew text plus an English or a German translation, the Hebrew paginated from right to left, the vernacular from left to right. The Hebrew title is Minhag America, T'fillot B'nai Yeshurun (the name of his congregation); the German, Gebet-Buch fur den offentlichen Got\tesdienst und die Privat-Andacht (Prayer Book for Public and Private Worship); and the English, simply, The Daily Prayers. The form of the traditional prayer book was retained, but passages which did not conform to “the wants and demands of time” were freely deleted. Thus, where the Merzbacher prayer book has “send a redeemer to their children's children,” Wise changes the Hebrew goel (redeemer) to geulah (redemption) and the translation to read “bringest redemption to their descendants.” it came to be known as the Wise Prayer Book, as a fitting tribute to its architect and fashioner, who saw to its publication and promoted its distribution. Isaac M. Wise (1819-1900). 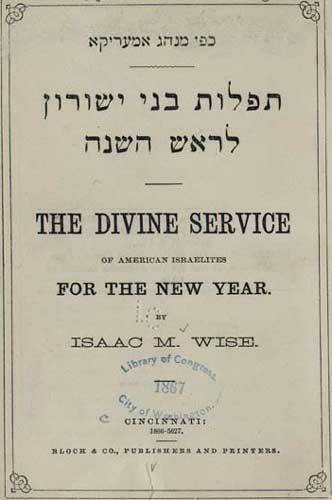 Minhag Amerika [The Divine Service of American Israelites for the New Year]. The one Temple in Jerusalem sank into the dust, in order that countless temples might arise to thy honor and glory all over the wide surface of the globe. When Reform Judaism shaped its first official prayer book, The Union Prayer Book, the model chosen was Einhorn's Olat Tamid. 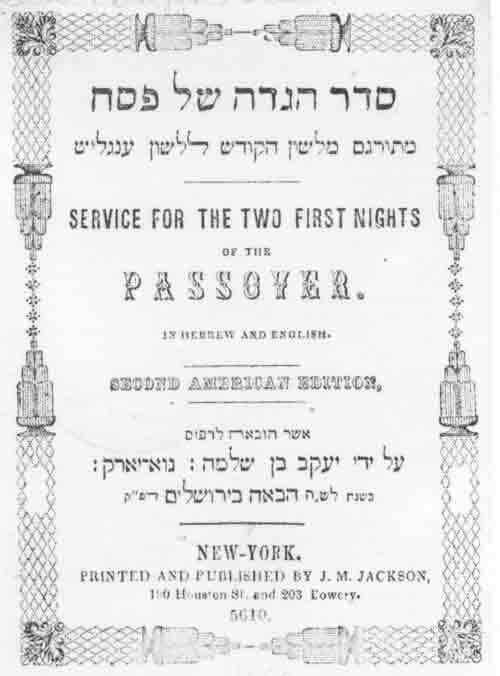 The first American edition of the Passover Haggadah was published by Solomon Henry Jackson in New York in 1837. it is fitting that this second American edition be the publication of his son John M. Jackson, who succeeded his father as the Hebrew and English printer for New York's Jewish community. On the back cover Jackson announces that he can supply blank ketuboth (marriage contracts) printed to order “on parchment if required” and a family and pocket luach (calendar), and boasts that his prices are “as cheap as the cheapest!”. Seder Haggadah shel Pesah (Service for the Two First Nights of the Passover), second American edition, New York, 5610 (1850). Hebraic Section. A truly American note is found in a Haggadah published in New York in 1878. The text is traditional, the translation usual, but the seder table scene is new. It shows a turbaned father and a prim mother with the wise son, a kippah (skullcap) on his head and reading from a book, at their side. Across from them, the simple son sits bareheaded, as does the one “who knows not how to ask,” while the wicked son, bareheaded, is leaning back on his chair, smoking a cigarette. Haggadah illustration is commentary. Although the title page claims in large bold capital letters WITH NEW ILLUSTRATIONS, the only new one is the one shown here. An American family at the Seder table presents a new version of the depiction of the “four sons” described in the Haggadah. The wise son, kippah (skull cap) on head, is looking at that Haggadah before him; the simple son, or the backward one, is thumbing his nose and getting his finger burned by the candle; and the wicked son, bareheaded, his chair tilted back, is smoking a cigarette. 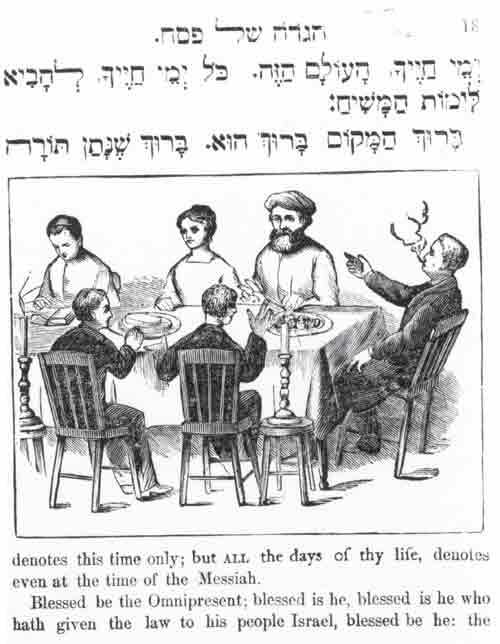 Seder Haggadah L'Pesah (Form and Relation of the Two First Nights of the Feast of Passover), New York, 1878. Hebraic Section.